HourPower Watches was started in the year 2000 in Cleveland, Ohio by Brenda Ellner, Ph.D. and business partner Paulette Nance. Today, the company has many other investors and Ms. Nance has moved in another direction. A new and dynamic executive team is in place. The biggest challenge facing the company has been to find additional capital to stock more inventory. That's a great problem to have, because it means the business is growing by leaps and bounds! Recently, the company was chosen as a finalist in Jumpstart! Inc. Jumpstart is a nonprofit company that helps develop local businesses that it thinks might find success and invests up to $250,000 in that business. Brenda Ellner, Ph.D., a psychotherapist and medical anthropologist, has worked with people for thirty years, trying to help them change their lives for the better. Her work with clients inspired her to create a product that would help her patients with a tool she'd found to be profoundly powerful - positive affirmation. Initially, Ellner had patients carry a note card that they would use throughout the day to reaffirm their self worth by reading positive statements printed on the card. Clients said that the technique helped them tremendously but they wished they had a better place to keep the positive affirmations. She came up with the idea for the HourPower watch, which has a hidden compartment where the wearer can place a message or photo that has special meaning to them. "We have created a watch that can help each wearer actualize their life in very special ways," says Ellner. "We offer so much more than just the time. When you open an HourPower watch, you can experience a connection to anything important - whether it is someone you love, an affirmation about yourself, an affiliation with a business, a remembrance of someone, an inspiration, a motivation, etc." HourPower currently offers around 50 different styles in their quartz line. The prices range anywhere from $90 to $260. There are 12 styles in the Automatic line called Visala. Visala is Italian and means "two chambers". These watches range from $300 to $800. There are 6 styles in the chains and charms line. They range in price from $220 to $260. In addition, HourPower offers some unique charms for $12.50 to $50 each. 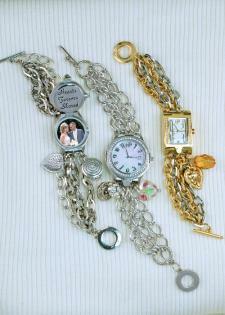 "These watches were developed for women to denote their life story in a very pretty jewelry watch piece," added Ellner. The company offers a solid stainless steel watch that is equivalent to high end watches on the market. "We pride ourselves in giving our customers a very unique timepiece with wonderful mechanics that allows the watch to open and close smoothly for the life of the product," Ellner says. She adds that men love the functionality of the watch as well: "They are always telling us they feel like James Bond. We believe that they are also very sentimental and the watch allows them to privately carry meaningful pictures and messages with them." HourPower watches offer a five year warranty. The company has a repair center where the watches can be sent for repair. HR Watches International Magazine called the Visala "the best gift purchase for men under $1000." Although the company is still fairly young, it is growing quickly. When they first started, high sales volume seemed to fall in April, May, and June and for Mother's Day and Father's Day. Now, the company does a lot of business during the Christmas holidays and has added the wedding market, remembrances, corporate sales, religious markets and inspiration and affirmation. They now stay busy throughout the year. The his and her matching watches have both a male and female size with the goal of couples sharing their watch style. Ellner says they sell many of these watches to the wedding market or for anniversaries. The most unique order the company has filled to date was for the National Gospel Awards Ceremony. Ellner says, "The Williams Brothers were the winners and the watches had special engraving around the bezel of the watch, and inside that congratulated them. Inside the hidden chamber was a special custom color coin. They just loved them and have since placed other orders. The company has many other celebrity customers. HourPower watches are also used by people working through 12-step programs. "We are very proud that our product is changing the way people can use watches-helping people accomplish their goals and dreams." This is an exciting year for HourPower Watches. "Our company is growing by leaps and bounds and we are bringing in two new watch lines," said Ellner. One line is a high end watch group that will be offered by fine jewelers. The line will offer precious metals, diamonds and Swiss movement married to a sleek, streamlined design. The watches will start at $295 and run up to $1000.The second line is a metal line that will have mass market distribution. The watches will have a modern look and will run $50 to $70. This watch is expected to be popular for corporate gift giving, or with schools, organizations or those just wanting a more moderately priced watch with HourPower's dependability and uniqueness. The Hourpower Watches have an identifying logo which is the spiral on the lift tab. "The spiral is the spirit of every product we produce. It is a universal symbol of the journey we take throughout our life, for life itself. It reminds us that our watch company is different - we produce watches that will change the way people use their time! Time is precious and they are precious." Brenda Ellner emphasizes that they have patented a new category of watch design. The produce is meant to make people's lives richer, better, more inspired and more successful. The driving force behind HourPower seems to be a deep awareness of the clients who wear these timepieces and make them a part of their lives.